So this is my first post of the New Year 2015. Yes I know, i know its already 20th, but I felt like I have to mention it as it is my first post for this year. Sure 2014 had its ups and downs. But what is life, without its usual ups and downs. “We have to continually be jumping off cliffs and developing our wings on the way down” ~ Vonnegut. It is been a year I started to blog and I still remember the dilemma that I had whether to start a blog of my own or not. But something from deep inside me pushed me to start this journey called food blogging and i created an account in wordpress sometime around late at night on November 2013. But I did not create any post for about two months and went to an hibernation mode. One fine day in the month of January 2014 i remembered about the blog and i went to create a post on the Pongal day – being the auspicious day that it is, photographed the sweet pongal and i clicked that ‘publish’ button. Slowly another blog post, and another one and another one and I got glued to the blogging world. I had absolutely no idea or expectation as to where this journey will take me nor did I had any idea as to what I am getting into. But I must say what an amazing journey it has been so far! That interest for good food, cooking, moments and stories revolving around food pushed me to start this journey called food blogging. And the wonderful fellow food blogging friends that I made along this journey make it all the more interesting and beautiful. Yes, i am so much in love with what I am doing and am going to pursue it further. This year is going to see more of simple, wholesome food, authentic Indian Cuisine and healthy recipes. There is cooking and eating with my family like never before these past weeks, what with the Christmas, the New year and then the Pongal celebrations, but nothing has been very much noticeable on the blog. Finally, I had some time to make a post for the blog. Place the milk and water in a deep pan and allow it to boil. Once it boils well, add tulsi leaves, tea powder and sugar. Let it boil for 5 minutes. When it has boiled well, remove from flame. 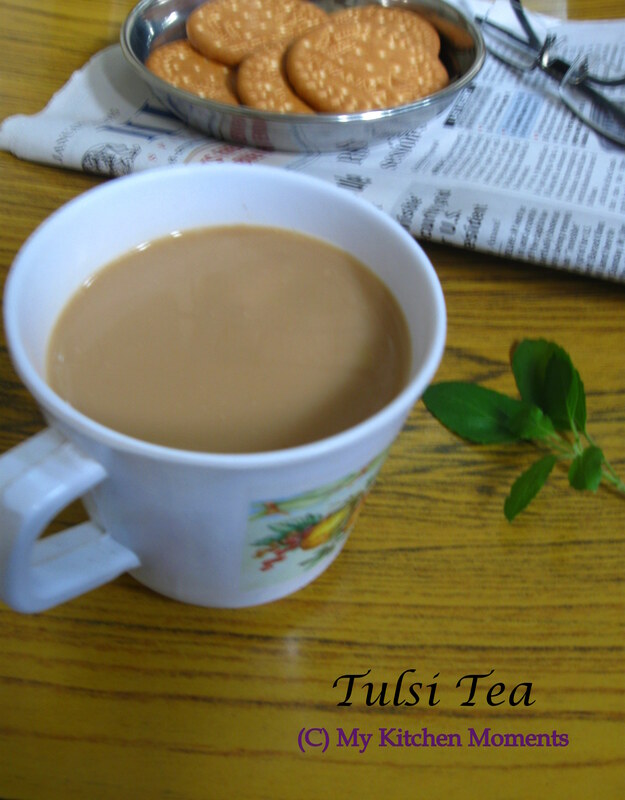 Filter the hot tulsi tea in cups and serve hot. 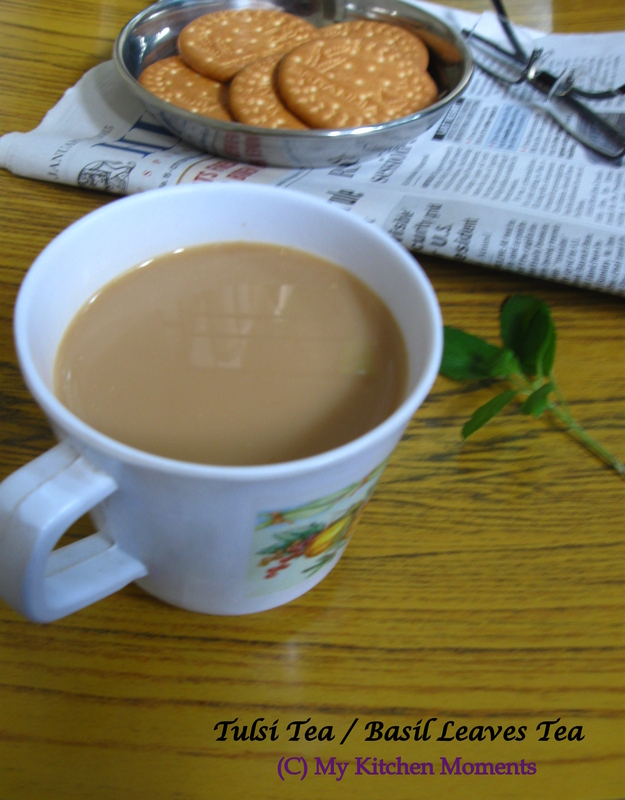 If you prefer, you can garnish the hot tea with tulsi leaves. Keep on sharing your moments.. Happy new year. Ha.. Thank you Malar 🙂 Happy and Prosperous New year to you and your family! Tea made healthy. Love it! !